Behold the fascinating story — based on true fact — of a world-famous artist and a little girl who became one of his models. 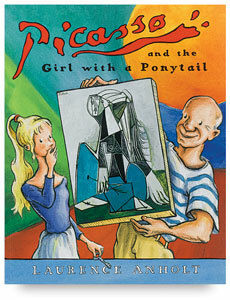 Sylvette first met Pablo Picasso in 1954, when she was a girl in the southern French town of Vallauris. At that time, she was the shyest and dreamiest girl among her friends (although today, she is a respected artist in her own right). When Picasso set up his studio in a nearby house, he spotted young Sylvette and was taken immediately by her classical profile and her lovely ponytail. When at last he convinced her to pose for what became the first of more than 40 works of art, the two gradually became good friends. Before long, Picasso’s portraits of Sylvette became famous around the world. Laurence Anholt is a British writer and illustrator whose books for children include Van Gogh and the Sunflowers, Degas and the Little Dancer, and The Magical Garden of Monet . Anholt’s popular books for children have been published in 15 different languages, including Cantonese, Hebrew, and Icelandic. As both an author and an accomplished illustrator, he has created a charming series of children’s stories about famous artists. He and his wife, Catherine, both successful authors of juvenile titles, have three children, from whom they obtain many of their story ideas. They live and work in Lyme Regis, Dorset, England. Appropriate for children ages 4–7. Paperback. 32 pages. 9¼" × 11½" (24 cm × 29 cm).